There is a good chance you've probably heard about an incident where a toddler and her parents were removed from a flight because it was believed that the child was on the No Fly List. It turned out an airline computer glitch is what caused the confusion. With that said, I wanted to take a few moments to explain the No Fly List. The No Fly list is maintained by the FBI's Terrorist Screening Center (TSC). Here is some information from a post I wrote a few years ago. The No Fly List is a list of individuals who are prohibited from boarding an aircraft. Another list – the "Selectee" list - is a list of individuals who must undergo additional security screening before being permitted to board an aircraft. After 9/11 the TSC was created through a Presidential Directive to be administered by the Federal Bureau of Investigation, U.S. Department of Justice, in cooperation with the departments of Homeland Security, Defense, State, and Treasury, as well as the Central Intelligence Agency. The purpose for the TSC is to consolidate terrorism based watch lists in one central database, the Terrorist Screening Center Database (TSDB), and make that data available for use in screening. Intelligence and law enforcement agencies nominate individuals to be put on the watch list based on established criteria, with the list maintained by the TSC. The No Fly and Selectee lists are subsets of the TSDB and are maintained by the TSC. The terror watch lists keep legitimate terror threats off of airplanes every day, all over the world. According to the GAO, terror watch lists have "helped combat terrorism" and "enhanced U.S. counterterrorism efforts." This is a good opportunity for me to segue into Secure Flight. Secure Flight is a behind-the-scenes program that streamlines the watch list matching process. It improves the travel experience for all passengers, including those who have been misidentified in the past. If you have been told or suspect you are on the No Fly List, let me ask you these questions: Have you obtained a boarding pass? If so, you are not on the No Fly List. Have you flown? You would not be allowed on a flight if you were on the No Fly List. If you’d like to comment on an unrelated topic you can do so in our Off Topic Comments post. You can also view our blog post archives or search our blog to find a related topic to comment in. If you have a travel related issue or question that needs an immediate answer, you can contact us by clicking here. This explanation is as weak as it is unbelievable. Simply put, you are lying! Please explain the "computer glitch" in more detail... in any case, it doesn't really matter, because "computer glitch" or not, the TSA mechanism nonetheless identified this particular baby as being on the No Fly List. Her family was told that she was on the No Fly List. They were taken off the plane and treated as terrorist suspects. Do you guys EVER acknowledge that you screwed up? EVER? Just ONCE? "This is a good opportunity for me to segue into Secure Flight. Secure Flight is a behind-the-scenes program that streamlines the watch list matching process. It improves the travel experience for all passengers, including those who have been misidentified in the past." No, Bob, it's NOT a "good opportunity to segue into Secure Flight" or anything else. I know you are leaderless right now without Kristin. Regardless, you people just don't get it. First, your post mentions the No-Fly list and the "Selectee List" but you only address one of those lists by your example. Which leads me to the second point and that is the gross violation of Due Process the "Selectee List" presents. I don't know if I am on the list, I can't know why I am on the list, and I can't find out how to get off the list. Guilty until proven innocent made worse by secret laws that basically prevent me from ever proving myself innocent. And I am going to guess that I am already on the Selectee List since the last ten times I've been to the airport I have had the SSSS tag on my boarding pass. I don't just use that as my moniker, I truly do get the SSSS on every boarding pass. Good grief. Do people actually READ the blog articles? The "computer glitch" was JET BLUE'S computer glitch. As BB said, if you get a boarding pass, you're not on the "No Fly" list. How is it TSA's fault if Jet Blue screws up? "Good grief. Do people actually READ the blog articles? The "computer glitch" was JET BLUE'S computer glitch. As BB said, if you get a boarding pass, you're not on the "No Fly" list. How is it TSA's fault if Jet Blue screws up?" Even if the people at Jet Blue messed up, the TSA employees should have figured out something was wrong immediately when they found the person was a child. Both groups get the blame for this one. "And I am going to guess that I am already on the Selectee List since the last ten times I've been to the airport I have had the SSSS tag on my boarding pass." Dude, let me make it easy for you since you can't seem to do the math - YOU ARE ON THE LIST! ....And they post about how clueless the TSA is! IF YOU ARE ON THE LIST YOU DONT GET A BOARDING PASS!! "computer glitch" Part of the problem is most families buy the cheapest advance purchase fare-understandable, how many of you bought tickets for the same price adult and child. The discounted childs fare would be off full fare, so the airline computer of course treats all names and fares as equal. For example refundable $1200 RT fare vs $238 RT advance purchase is still less than a 50-75% discount for a child fare. Maybe it is not either TSA or Airlines fault. With e-tkts many head straight for gate. Please clear up some confusion. This was a kid, right? I seem to recall reading here, in response to other similar situations, that children are NOT on the "no fly" list. Are children on the "no fly" list? Well, that's how it is supposed to work. Of course, if you have 12 inch blades on your person, Like Adam Savage, you're not supposed to get through security. If you have a metallic object in your shirt pocket, like Jonathan Corbett did, you're not supposed to get through. If you're a soldier and have C-4 in your bag... the TSA is supposed to catch you. Of course they did... on the second leg of his trip, meaning the TSA missed it the first time. So, can you see how, when it comes to the TSA, what happens and what is supposed to happen aren't always the same thing?? I find it improbable that a computer happened to glitch on a single Muslim name. What are the odds? Usually a glitch affects a whole bunch of people, or it hits one person at random. The chances of it glitching randomly on a Muslim name are pretty amazing. Maybe this isn't specifically TSA's fault, but if TSA's no-fly list wasn't so Kafkaesque, this wouldn't have happened. And how about acknowledging the human cost of this sort of incident? These people were humiliated, and lost time, money, and whatever their plans were at their destination. You don't even mention that these people were needlessly, seriously hassled by this, all you're concerned about is institutional finger-pointing. Have you not read any of the News stories...TSA was called took one look at the child in question and cleared them...the family chose not to fly...TSA agents are human and can make mistakes...but this time they did what was right! Sorry, not credible. The computer "glitch" being blamed on Jet Blue resulted from a TSA-validated database application, did it not? Or would you have us believe that each airline has its own no-fly list with no TSA/DHS oversight? Please don't believe the explanations posted here without thinking critically. As we've seen over and over again, the stories presented here are frequently wrong. To wit, the strip-searched senior citizens. Claims of not having people remove medical appliances. I could go on but these examples easily prove the point. "Have you not read any of the News stories...TSA was called took one look at the child in question and cleared them...the family chose not to fly...TSA agents are human and can make mistakes...but this time they did what was right!" Awesome! We have a new motto for the TSA: "but this time [we] did what was right!" The TSA will be reformed, screeners will be called screeners and sanity will return to our airports as security is provided the traveling public. Funny that TSA is notably quiet on expert analysis that indicates the latest underwear bomb would have easily passed through security. Comments Bob? Transportation Security Administration spokeswoman Sterling Payne told CNN in a statement. "TSA was called to the gate by the airline and after talking to the parents and confirming through our vetting system, TSA determined the airline had mistakenly indicated the child was on a government watch list. That sounds like more than "took one look" to me. But how many lists do you have? There's the "No Fly List," for suspects you've deemed too dangerous to fly but not dangerous enough to arrest. But isn't there also a list of people deemed not dangerous enough deny the privilege of flying, but suspicious enough to receive extra special courtesy above and beyond the regular professional and respectful service your officers give all their valued customers? Can you give any more insight about that beyond "SSI"? A computer glitch? If there were no secret lists that you're not even allowed to find out if you're on, unless you try to fly, then the TSA wouldn't have to worry about a "computer glitch." Whether it was the airline's fault or TSA's is irrelevant. If it weren't for these unconstitutional lists, this would have never happened. remember, rules are only for the little people. Much as I like a good TSA bashing session, this one sounds like it's on Jet Blue. The cases were heard on writ of certiorari. 355 U.S. 881. The Court reversed on a split decision. Kent v Dulles is the first case in which the US Supreme Court ruled that the right to travel is a part of the "liberty" of which the citizen cannot be deprived without due process of law under the Fifth Amendment. The No Fly List is clearly illegal when applied to Citizens of the United States and visitors in the United States. Any TSA employee who attempts to restrict a persons travel without due process is in violation of their Oath to Defend The United States Constitution. If government has evidence that a person is engaged in illegal activity then arrest, charge, and prosecute the person. Otherwise stop violating our right to travel. The "no fly list" is indefensible. The very idea that there are identifiable people so dangerous that they shouldn't be allowed to fly but who haven't even been issued with an arrest warrant, let alone convicted, is an insult to the rule of law. A 'computer glitch' has nothing to do with this incident. These people were, in fact, ordered removed from the plane by a TSA agent or supervisor, with law enforcement present. A child, a baby! And a TSA agent, ANY TSA agent, would do this WHY?! A baby!!! That is NOT a computer glitch, that is a competence glitch, an intelligence glitch, even--horror or horrors--a common sense glitch. Are you telling me that if the no-fly list has a name that match that of an infant on a flight, that the infant and parents will be removed from the plane under threat of force by TSA? Even though American babies are NOT terrorists?! A computer glitch. Don't insult our intelligence! Are dead people issued TSA badges? How about learning to read instead of spouting inaccurate information. This person did not work for TSA; he worked for a private security company and his badge was issued before TSA was started. "How about learning to read instead of spouting inaccurate information. This person did not work for TSA; he worked for a private security company and his badge was issued before TSA was started." It does, however, point out yet another flaw in the TSA's security theater. 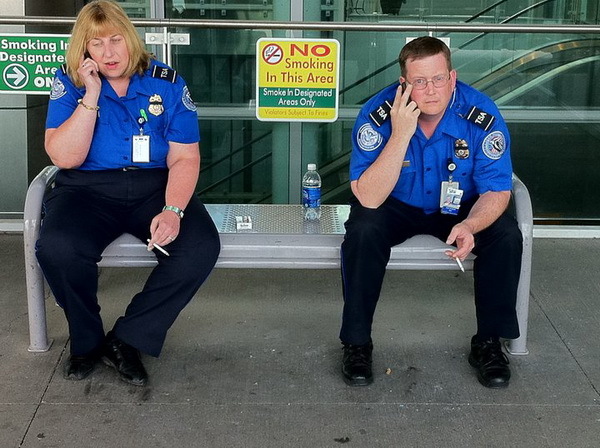 Hope no actual terrorists were hired to work in airports prior to the TSA's existence. Not sure I understand why a ticket sale is even allowed if someone is on the no-fly list! Why allow the transaction at all? In this case I'd have to say the airline share some blame, but I think it's not good enough to blame the airline and wash your hands of the problem. Some common sense, and diligence is required, and the issue could have been dealt with in a more professional manner. I wish there was a similar policy here in Asia, it would save so many incidents of individuals on the run making there way around freely within this continent, sure theres some draw backs to the policy, mistakes can be made but on the whole excellent. My name is Mark Faulk, I'm sitting in a hotel room in Minneapolis as I type this. No, I'm not on the actual "No Fly List" (even though I was told that and surrounded by TSA at the ticket counter once), but I am on the Selectee List. It takes me an extra hour of confusion and searches every time I fly. Except for today....I spent 7 hours at the Minneapolis Airport, and missed my connecting flight because you can't do your job properly. I AM A FILMMAKER and WRITER, and the people I'm a threat to are Wall Street crooks and incompetent politicians. My only weapons are words and a movie camera. I'm sick of being harassed for doing the right thing. Have someone from the TSA office call me and we can work this out in ten minutes. Use your resources to catch real crooks, NOT political activists. you didnt really think this list was for any good doing did you? The one question I have that I can't find an answer to anywhere, as if I am denied boarding due to being on a no-fly list does the airline have to refund my money in the case that it would be a normally non-refundable ticket? In most cases I know they would just try to give you Airline credit, but that doesn't really help someone who's on a no-fly list. If anyone has an answer to this question I could really appreciate it because it's not just academic, I'm planning on traveling in two weeks and my tickets cost over $1,200 which if I'm denied boarding I will need for my rent. Please if anyone can help me I'd really like to get an answer. Thank you.